Traditionally there has been under-representation from protected groups on the apprenticeship programme in Wales, with only 1.5% declaring themselves as having a disability or health condition. The Welsh Government is concerned that this figure is disproportionate to the disabled population of Wales and is now launching the ‘Inclusive Apprenticeships – Disability Action Plan’ which aims to drive a culture change on the apprenticeship programme in Wales and remove barriers to participation for disabled people. 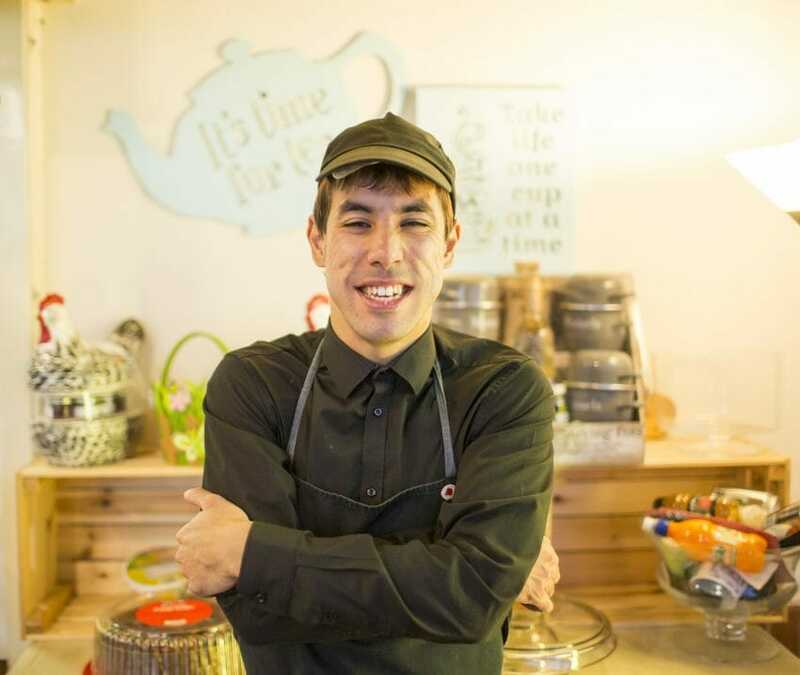 One person who has felt the life-changing benefits of an apprenticeship despite his autism-related learning disabilities is 25-year-old Nicholas D’Cruz from Swansea. Nick has been employed as an apprentice at Café Darcy in Neath since June and says it has been transformative, helping him to learn the skills he needs to live a more independent life. Nick’s severe learning disabilities affect his ability to communicate and be independent. He wanted a job that would help him towards his long-term goal of moving out of the care home where he lives, into supported housing. His social worker and Job Centre Plus adviser linked him with Shaw Trust, a charity helping people to enter work, gain an education and training, and improve their wellbeing. They helped Nick put together a plan to help develop the skills he needs to live on his own for the first time. Shaw Trust key worker, Michelle Hunter Smith, helped him start a placement at the café, based in Darcy Business Centre in Skewen, above Shaw Trust’s offices, and he’s now on a Level 2 Foundation Apprenticeship in Hospitality with the training provider, People Plus Cymru, supported by DWP Access to Work. “It’s a busy job. I clean up, collect dishes, chat to the customers and I’ve just started to prepare food,” said Nick, who rides his bike the 40-minute journey from home in Clydach to work. Formula One fan Nick, who also loves to watch the Ospreys play in his spare time, added: “Doing an apprenticeship has changed my life. It’s helped me financially. I can go more places and do more things. I went to Silverstone this year and I love musicals and go to as many as I can. Apprenticeships allow individuals to gain job-specific skills and professional qualifications while working, along with a regular wage, paid holidays and benefits, and they’re available to people aged over 16, living in Wales and not in full-time education. Almost all job sectors have apprenticeship programmes and the majority of apprenticeships can be made accessible for people with additional needs. Minister for International Relations and the Welsh Language, Eluned Morgan, said: “In Wales, only 45% of working-age disabled people are in employment compared to 80% of those who are not disabled, and so it’s important to encourage disabled people to apply for apprenticeships and make sure everyone knows about the support that is available. “There is often a perception that there are barriers to hiring people with a disability, when most disabled employees don’t need any adjustments, and for those who do, they involve little or no cost at all. There is an untapped talent pool of workers in Wales who could benefit from an apprenticeship, while bringing new skills to organisations across Wales. The Welsh Government’s Apprenticeship Disability action plan aims to remove any potential barriers that may currently be preventing disabled people from applying for apprenticeships by calling on employers, apprenticeship providers and other specialist organisations to work with them to ensure that there are opportunities for disabled people to find and stay in work. For more information on apprenticeships and the benefits of a diverse workforce search Skills Gateway for Business, Wales.